Maze-O's brightly-colored tiles with raised edges are perfect for small hands. Turns, branches, and dead-ends combine for countless labyrinths. Every piece connects to every other piece. Follow the fifteen, double-sided design cards. Create mazes from scratch. Use your own toy vehicles and action figures to travel along the newly-created passages. Kids will be a-mazed! 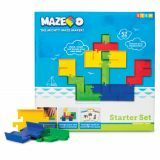 Maze-O 52-piece Starter Set includes: 16 Turn, 8 Branch, 8 Dead-end, 16 Straight, 4 Entrance-Exit, and 15 Double-sided design cards. Meets ASTM, US CPSC, and CPSIA safety standards. Physics fundamentals become playtime fun with the Pendulonium STEM Challenge from Learning Resources. This hands-on activity set challenges kids to send the included launch balls flying toward goal cups and targets with the help of a three-piece adjustable pendulum. What seems like a collection of simple tasks will actually challenge each child's engineering, problem solving, and critical thinking skills as they play around with early physics concepts such as force and momentum in search of the ideal solution. 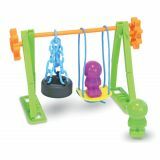 In addition to using their brains, kids will also have to make careful use of their muscles—the pendulum in the Pendulonium STEM Challenge is completely kid-powered, and helps build hand-eye coordination and muscle control without the need for extra batteries, springs, or rubber bands. Each activity set comes with a full-color booklet filled with easy-to-build challenges, which also ramp up in difficulty to encourage leveled play and continued development. Building with Q-BA-MAZE sparks even more creativity when cubes light up as marbles race through! Add gleaming eyes to your dragon maze. Build a marble run that looks like a light bulb and glows like one too! The possibilities are endless and brilliant! The motion-activated cubes flash blue, red, yellow or white every time a marble hits the cube floor. Light-up cubes are battery operated; the batteries are included and can be replaced. All light-up cubes are single exit and compatible with all Q-BA-MAZE 2.0 sets. The Deluxe Set amps up the fun with 8 light-up cubes (2 of each color) that create stunning light show displays. The set also includes 4 straight-away rails and 52 standard cubes for expansive marble mazes and zooming marbles. 20 marbles complete the set. 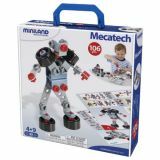 One of the most brilliant STEM toys for developing creativity, critical thinking and problem solving skills. An exciting introduction to the building blocks of engineering and math. 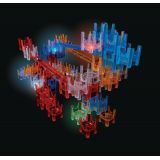 Includes 8 light-up cubes, 4 rails, 52 colorful cubes and 20 steel marbles. Cubes that keep you guessing and rails that go the distance really ramp up your marble run fun! The unique design of Q-BA-MAZE cubes allow for a limitless range of configuration options. 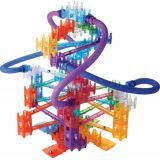 The 7.5-inch straight-away rails connect easily to any cube or to each other to create tracks that send your marbles zigzagging through the maze of colorful cubes. Plus, the precision engineering of the double-exit cubes gets everyone wondering, "Which way will the marbles go?" 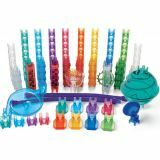 Includes 82 cubes, 18 straight-away rails, 4 coaster tubes, 4 marble catchers and 30 steel marbles. Set sail with real STEM learning! 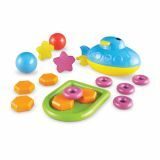 Young learners can dive into early physics in a fun, colorful way with this two-piece submarine and floating raft along with weights, balls, and stars to bring investigations to life. This set also features 10 detailed activity cards (with over 20 engaging, high-impact activities) that cover all aspects of STEM, plus key science concepts of buoyancy, density, and more! Comprehensive activity guide with reproducible materials is also included. Relive the spectacle of your childhood with Smartivity Fantastic Optics Kaleidoscope S.T.E.M. Education D.I.Y. Toy making kit. Introduce your child to an infinite sequence of patterns, a dazzling world of colours. First designed by Scotsman Dr. David Brewster in 1816, a kaleidoscope is not just another toy. It is a portal into the fascinating world of patterns and colours. Used as a source of inspiration by designers and artists, kaleidoscope inspires creativity and introduces your child to the wonders of light, colours and reflection. Give your child a peek into the magical new dimension where colours dance and wonders abound. Vibrant and colourful, Smartivity Fantastic Optics Kaleidoscope S.T.E.M. Learning D.I.Y. kit opens up a world of patterns and designs for your child. It contains all the elements necessary to build this spectacular device. 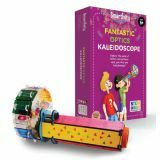 Just fill the kaleidoscope drum with colourful trinkets included in the kit, and watch your child explore the wonders of light and colours. music to every ear... With this project, children can actually compose their own music tunes. The project includes all the elements required to build a musicmachine, including pegs for arranging and rearranging notes. Once assembled, children learn about music notations and can compose their own tunes by placing the pegs in different slots. The box also contains instructions for composing two simple tunes and allows children to explore the magical, wonderful world ofmusic. 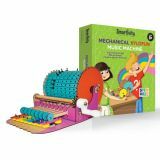 Help your children understand the basics of hydraulic mechanisms with this amazing S.T.E.M. Learning D.I.Y. project! Hydraulic Machines use the power of water pressure to carry out specified tasks. From cranes to braking mechanisms, hydraulic power finds widespread use in daily life. One of the coolest Smartivity STEM Learning Educational D.I.Y. 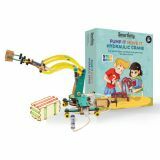 Toy Kits, the Smartivity Pump It Move It Hydraulic Crane introduces children to the fundamentals of hydraulic machines in the most playful and engagement filled manner. The kit contains all the elements essential to build a fully-functional hydraulic crane, richly-illustrated and easy-to-understand step-by-step Instruction booklet and tools to embellish the project once built. Once assembled, children can use their Hydraulic Cranes to life objects and move them around. The project assembly provides at least an hour-long engagement and the game-play ensures that children proudly continue to play with the project even after.